Notes from my extremely glamorous life: it’s summer (and it’s still not Christmas) | Where's Zoe now? As J. pointed out, we even had cherries. Definitely Christmas. 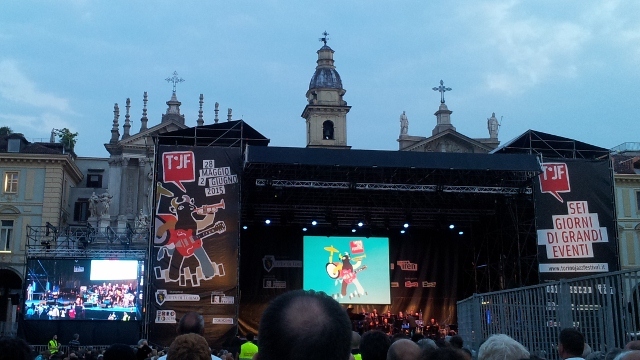 Last weekend was the Torino Jazz Festival. Every year I declare that I’ll go to as many concerts as possible and give up on sleep for the weekend. Every year what happens is one night, the weather will be too wet for outdoor concerts, another night I’ll be too tired, and suddenly it’s the last day of the festival and I’ve only seen one band all weekend. Seems my dedication to free jazz concerts is more theoretical than practical. The acoustics in Piazza San Carlo aren’t even that good, but the two churches and dramatic skies make a good background for the stage. Summer has snuck up on me this year. I got complacent. Spring has been so warm, and summer last year was so mild, that I’m somehow surprised that it kept warming up these past few weeks. Now it’s hot and humid and I can’t remember how to do basic things like sleep when it’s warm. It’s only been the past couple of days that I’ve remembered to close the shutters on my balcony doors when I leave for work in the morning, so the afternoon sun doesn’t turn my living room into a greenhouse. Well, I’ll work out how to do summer again, or I’ll melt. I’m something of an avoider, but at the last minute, well into the second half, I figured I should go and check out the big screen broadcast of the game. After all, if Juventus won, I wouldn’t sleep at all for the cheering in the streets, so I might as well join the party. On my way I passed a pair of police officers, leaning on their car with the radio commentary turned up. They didn’t look too happy. Turns out Juventus were losing. As I headed home, lightning spread over the sky and thunder boomed. It wasn’t the post-football party that kept me awake last night, it was the summer thunderstorm.